The Bible calls us to be hearers and do-ers ("producers") of God's Word. James 1 instructs us to tend to, nurture and watch over the growth of God's Word in our lives by putting it into action. 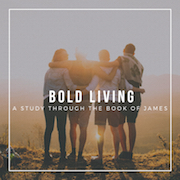 As we begin our new sermon series on the book of James, Bold Living, we look at the process of our faith being proven through trials, and the never-changing promises of God in trials. How do we love God with all our heart, all our soul, all our mind and with all our strength? How do we love God with more than our emotions? Lives of true and proper worship (Rom 12:1) begin with a true and proper perspective of God, and from that perspective flows attitudes of thankfulness and joyful service.